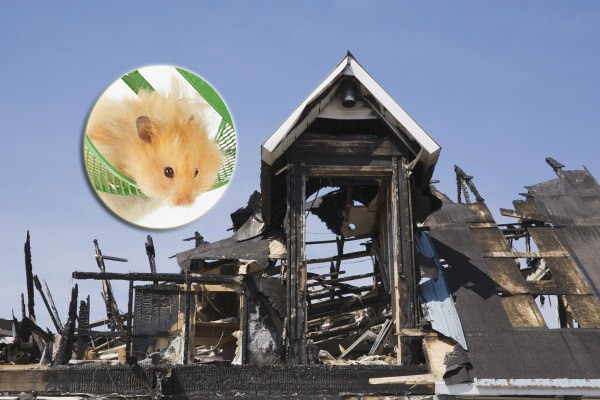 A British family was left homeless after a pet hamster started a fire. The hamster, named Pebbles, allegedly started the fire on 30 October by switching on an oven. Tracey Hill put Pebbles in the kitchen for the night because he was making a noise that prevented them from sleeping. She placed the restless hamster’s cage on top of the electric oven to keep him out of reach of their dogs. He continued to run on his wheel and the cage somehow moved closer to the plate switches and eventually turned one on. The cage was set alight and caused a fire that killed two of the family’s dogs and a chinchilla. Tracey and her son, Kae, escaped from the house in the nightwear. They were saved thanks to a smoke alarm that woke them at 4.30 am. They realised the kitchen and lounge were full of deadly smoke. Their double-storey house, in Bletchley, Bucks, suffered R360 000 worth of damage. Tracey and Kae were treated for smoke inhalation and now have temporary accommodation. The Jack Russell, Twiggy, and Poppy, a Yorkshire terrier, died in the fire. A third terrier survived. The family escaped with the clothes on their backs.